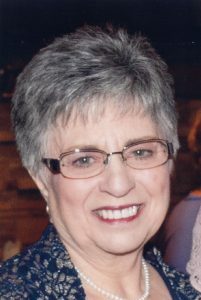 Joanna (Gambone) Diggins, 72, of Moon Twp., returned to her Lord and Savior on March 31, 2019 after a valiant fight with cancer. Her devotion to her Savior and firm belief in His saving grace, supported her in her final struggle. She was an example of Christ’s love to everyone who knew her. Throughout her life she maintained a sweet and simple demeanor that won the trust and hearts of many, who even now are being changed by the witness of her love and faith. Her caring heart will never be forgotten. Joanna was born in Philadelphia, on September 30, 1946, the daughter of the late Vincent & Mildred (Masino) Gambone. She is survived by her husband of over 50 years, Joe Diggins. Three children, Joseph Diggins (Hope), Sewickley; Brian Diggins (Amy), Moon Twp. ; Tricia Flagg (Jon), Wexford. Eleven grandchildren: Reilly, Pierce, Alexandra, Tyler, Ethan, Reagan, Lucie, Avery, Cameron, Jiovanni & Xzavion. A sister, Anita Gray, and a brother Vince Gambone. In addition to her parents, Joanna was preceded in death by a brother, Michael Gambone. Friends will be received on Tuesday, April 2nd from 2-4 & 6-8PM at The Huntsman Funeral Home & Cremation Services of Moon Twp. (1522 Coraopolis Hts. Rd.) and a Memorial service will be held on Wednesday at 11AM at St. Stephen’s Church, Sewickley. Private interment will take place at Sewickley Cemetery. In lieu of flowers, memorial contributions can be made to: The People Helper’s Ministry of St. Stephen’s Church (405 Fredrick Ave. Sewickley, PA 15143).